This Edward Snowden statue is up on Broad Street. You can now see Edward Snowden, the former CIA employee who rose to global prominence after leaking classified government information, in Philadelphia. Well, not exactly, but you can see his bust. 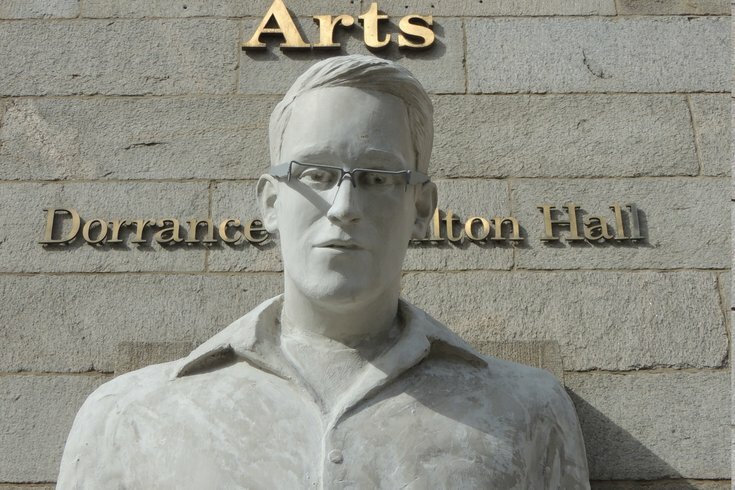 A statue of Snowden is featured in a new public art exhibition at the University of the Arts. The statue, appropriately named "The Edward Snowden Statue," is currently up in front of the school's Hamilton Hall on Broad Street. The work is by Egg Harbor native and UArts grad Jim Dessicino, who featured the statue in New York's Art in Odd Places Festival in 2014. The school is featuring the Snowden statue, along with a piece called "Immigrant Angel," in the exhibit because both are "politically timely and engage with the age-old tradition of art making public statement." The Edward Snowden Statue was created from the belief that sometimes, critical players in world history are deliberately omitted from public statuary and therefore public memory. The statue was created with impermanent materials, as the world has not yet cast a permanent judgment of the NSA leakers actions. Without a commission or permanent site, the statue is in limbo in solidarity with Edward Snowden. This sculpture will continue to travel, unsure of its future, in the public spaces of North America––where Snowden can live only in spirit. The sculpture asks us to question the validity of statuary as a means of transmitting history. Snowden, 33, is currently under asylum in Russia. His identity was revealed in 2013 after he admitted to leaking documents that provided information on NSA surveillance programs. Since then, Snowden has remained active through the media and his own Twitter account in being critical of the U.S. government. Before leaving office, President Barack Obama declined to grant Snowden a pardon. President Donald Trump has called Snowden a "spy" and "traitor" who deserved execution. Both statues will be up at least through the end of March and possibly a bit longer.